As Internet access increases in Asia and the rest of the world, the use of e-learning has expanded to offer formal as well as informal educational opportunities that were previously not possible to hundreds of millions of learners. As access widens, unique educational modules, courses, and programs are being designed and evaluated throughout the Asia region. 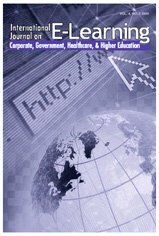 This special issue presents e-learning activities, primarily within higher education, taking place in eight countries from East, Southeast, South, and Western Asia. As is evident, each country has unique issues, challenges, opportunities, and initiatives related to e-learning and the use of technology in education. Bonk, C.J., Lee, M.M. & Reynolds, T. (2009). Preface: A Special Passage Through Asia E-Learning. International Journal on E-Learning, 8 (4), 438-445. Waynesville, NC USA: Association for the Advancement of Computing in Education (AACE). Retrieved April 23, 2019 from https://www.learntechlib.org/primary/p/30517/. Bonk, C.J., Lee, M.M., & Reynolds, T. (2008, November). Organizing committee, facilitators, and discussants for “E-Learning Asia Day.” Preconference Symposium at E-Learn 2008: World Conference on E-Learning inCorporate, Government, Healthcare, and Higher Education, Las Vegas, Nevada.